KOEI TECMO America was thrilled to reveal new information regarding the North American release of developer Omega Force’s most brutal Warriors title to date alongside a batch of new assets featuring characters from the series’ universe. Based on the iconic manga and anime series Berserk by Kentarou Miura, the game will be released in North America as Berserk and the Band of the Hawk on February 21, 2017 for the PlayStation®4 computer entertainment system, digitally for the PlayStation®Vita handheld system and on Windows PC via Steam®. A brand new trailer plus a selection of new screenshots and artwork released today introduce Guts’ companions Casca, Judeau, Serpico and Schierke – all of whom will be playable characters within Berserk and the Band of the Hawk. Berserk and the Band of the Hawk follows the compelling tale of the famed mercenary group The Band of the Hawk, focusing on its diverse cast of characters and their struggles as they fight to achieve their dream of owning a kingdom. Berserk fans and newcomers alike will experience the series’ popular Golden Age story arc, which depicts the meeting between the leader of The Band of the Hawk, Griffith, and the legendary Black Swordsman, Guts, as well as the gripping Falcon of the Millennium Empire arc, in which players will experience the group’s most brutal and devastating battles against humans and demons alike. 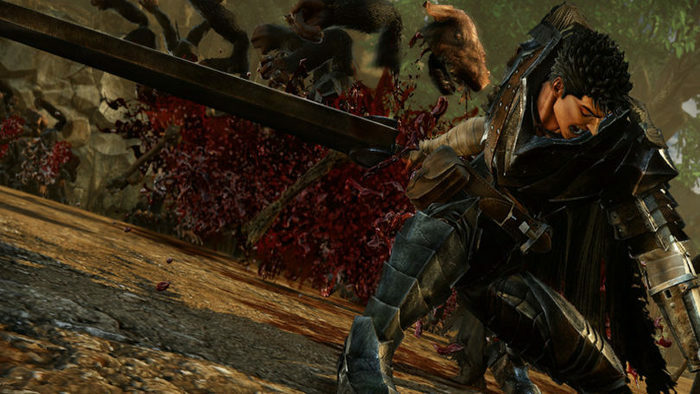 Berserk and the Band of the Hawk is based on the world-renowned series Berserk by Kentarou Miura, and blends the signature ‘one versus thousands’ style action of the long-running Warriors franchise with the grim and gruesome atmosphere of Berserk. Players will follow the daring and heroic journey of Guts, Griffith, Casca and the Band of the Hawk as they slash and smash their way through a sinister realm of magical and demonic fiends. View the official trailer shown at Tokyo Game Show 2016 below!